One of my favorite seafoods is scallops. I never used to think much about their shell, until I began to find them along the beach. The scallop is rounded in shape with protruding flaps at the hinge area (they are bivalves). Sometimes the flaps are similar in size and sometimes one is much larger than the other (Scaly Scallop). Sometimes they are worn and barely visible. Ridges fan out from that front point and can be thin, wide (Lion’s Paw), rough (Rough Scallop), or flat (upper part of the Zig Zag and Rough Ribbed scallops). Sometimes each half of the shell can look entirely different. Here in Florida there are a few varieties of scallops. 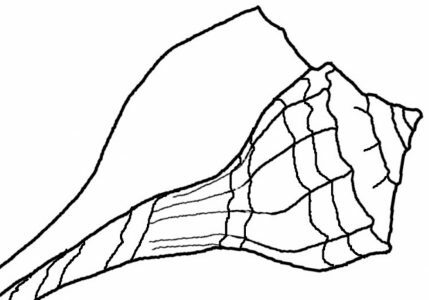 Probably the most common type is the Atlantic Calico Scallop (Argopecten gibbus). Shells are colorful in shades of pink and purple with other possible colors like yellow and orange. The entire shell can be colored, or it may have splotches or patterns of color over the shell. This type is what I find on the East coast where I beach-comb. Size is usually around 1-2 inches. One of the most unique looking scallop is the Kitten’s Paw (Plicatula gibbosa). It’s a tiny shell which is a bit thick and bumpy with more irregular ridges. The ones I have collected came from the Sanibel Island area. They are off-white with orange, or sometimes yellow, coloring with cross-hatch type markings. I have never found one on the East coast of Florida where I live, but my reference book claims this scallop lives all around the state. The Atlantic Calico Scallop (Argopecten gibbus) is probably the most commonly found scallop shell in Florida. I’ve collected them on the west coast and east. The brightly colored calico scallop shells in my photos above were collected on the West / Gulf coast of Florida. In comparison, the shells in my photo below (Calico shells only) were collected on the East coast. Shells in the Gulf area tend to be more well preserved as they are not churned up in the waves like on the Atlantic side. The black scallop shell was collected from the Ponce Inlet area. I’ve written a post about black shells, because black is not the normal color for seashells. If you’d like a free, printable coloring page which features the scallop seashell, click here. Atlantic bay scallops (Argopecten irradians) – can be larger than the calico and will reach 4 inches across. They are less colorful than calico also, and will be white, orange or grayish brown. These used to be very common all around Florida and now are not. Round-rib scallops – look similar to the Zigzag and also flat, but their ribs are wider. They are smaller than the Zigzag at max 2 inches. Rough scallops – This type is rarely found on beaches. Usually they are solid colored and only grow to 1.5 inches. They have rough ribs, with tiny bumps, hence the name. The coveted Lion’s Paw is a scallop shell with extra wide ridges. It is not commonly found anywhere here in Florida, but it is possible to find one. Your best chance of finding a Lion’s Paw would probably be over by Sanibel Island on the Gulf. Next Post Where Do You Stay In Florida?